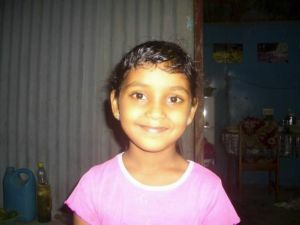 Krishmita is a 7 year old girl. Krishmita is the only child in her family living with her Mum and Dad. Her father worked as a machine operator at an agricultural station until his arm was severed in an accident and he lost his hand. He is now unemployed and has not received any compensation. 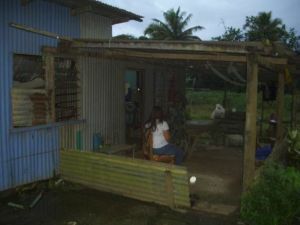 The family sells a few crops to earn money but is in a financially desperate situation. Krishmita enjoys attending school and her favourite subject is English. When she is not at school she loves to draw and paint. Krishmita travels to school each day by bus. The only breadwinner has lost his right arm and is now unemployed. 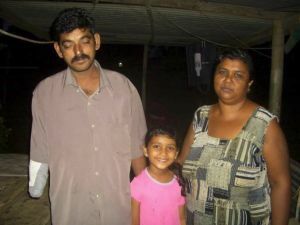 The family requires support to continue Krishmita's education. Krishmita with her Mum and Dad. Krishmita is now receiving the education that every child deserves.